The European Union still produces many of the world's finest and most advanced circular and hosiery knitting machines and 2017 proved to be another good year for the sector. In 2017, the EU countries exported circular knitting machines worth around EUR 150 million and sock knitting machines worth around EUR 130 million, leading the world’s knitting and hosiery industries with their superior technology. Among the EU countries, two countries continue to stand out in terms of knitting machine exports - Germany and Italy. 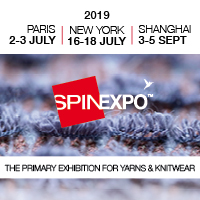 While Italy is the leader in sock knitting machines, Germany leads in terms of circular knitting machines for apparel fabrics and other applications. According to official Eurostat data, exports of European Union circular knitting machines increased by 3.1% in 2017 from EUR 144.9 million in 2016 to EUR 149.4 million. According to Eurostat, EUR 102.2 million worth of circular knitting machines were exported from Germany in 2016. In 2017, the figure was slightly lower EUR 101.2 million with Germany's share reaching 68%. Renowned international brands like Mayer & Cie. and Terrot continue to dominate large diameter machine sales, with small diameter specialist machine builders such as Harry Lucas also contributing. Italy is the second largest exporter after Germany and exported EUR 27.6 million worth of circular knitting machines in 2016. In 2017, this rose to EUR 33.3 million, giving Italy a 22.3% share of EU exports. Italian brands such as Santoni and Pilotelli (now owned by Terrot) continue to export globally. Turkey’s share was 18.3% in 2017. Exports of sock knitting machines from the European Union amounted to EUR 127.9 million in 2016, dropping slightly to EUR 127.5 in 2017. Exports valued at EUR 37 million (29%) went to Turkey in 2017, while EUR 23.8 million (18.6%) worth went to China. Italy was the largest exporter of sock knitting machines with exports of EUR 110 million in 2016 and EUR 111.2 million in 2017. Italy's share of EU exports in 2017 was 87.2%, leading the world with internationally celebrated brands such as Lonati, Sangiacomo, Rumi, Busi Giovanni and Cesare Colosio.